SkinMedica's TNS Essential Serum: Ready, Set, COLLAGEN! 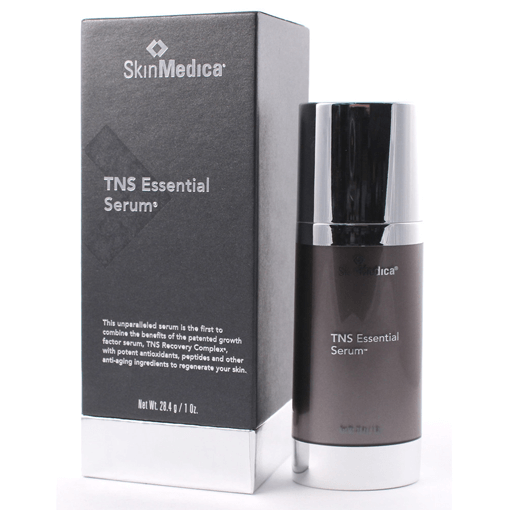 TNS Essential Serum is a rejuvenating treatment that hydrates, protects, and firms to improve the appearance of fine lines, wrinkles, uneven skin tone, large pores, and rough texture. Sound too good to be true? Nope! From promises to proven, Skinmedica is a science-based skincare that backs its claims of actually reversing the aging process with clinical studies and trials. What's in this amazing serum? Well, "TNS" stands for Tissue Nutrient Solution, and consists of patented growth factors, antioxidants, soluble collagen, sight-o-kines, and matrix proteins. The "star of the show" is human fibroblast conditioned media, or "HFCM." Human fibroblasts are cells that make up part of the skin's connective tissue, including collagen, and when skin is damaged (which happens daily), the body stimulates collagen production as a part of that repair process. Unfortunately, that process in which our skin is able to do so slows to a halt around mid 20's, and from then on we start to lose collagen and elastin. The logic behind the topical application of "HFCM," is to trigger this same process of repair through these skin-soluble external signals. Simply put, apply TNS Essential Serum topically, and it will allow your skin to start producing elastin and collagen on its own again! Some other specialty ingredients that SkinMedica has packed into this amazing topical treatment are aminobutyric acid, which acts as a neuromuscular inhibitor, relaxing facial muscles; and hyaluronic acid, which acts as a kind of molecular sponge, resulting in a smoothing and immediately plumping effect. In other words, short of making you a cup of coffee in the morning, this product has just about everything you need for the ultimate beauty sleep! When applied as directed twice per day, most start seeing the change in their skin the first month, with optimal results in 3 months. This is not something that you want to stop use of after one bottle, though. It's like going to the gym! We have to exercise our skin so that it keeps working for us. Make TNS Essential Serum a part of your daily skin exercise!